Two months ago, the US State Department hosted members of the White Helmets (Free Syria civil defense volunteers) at Foggy Bottom. At that meeting, the humanitarian group was praised for saving lives in Syria. Now the White Helmets have been told, without any formal notification from the US administration, that American financial support for them has been stopped. The news comes amid fears that long-term support may continue to stall, limiting the team’s ability to save lives. “Our meetings in March were very positive, with senior officials even talking of the possibility of long-term commitments until 2020, and there were absolutely no proposals to stop the support,” said Raed al-Saleh, head of civil defense. Now the Civil Defense team receive no US funding at all, with the State Department claiming that “support for civil defense is under review”. The United States had previously provided one-third of the team’s total funding. 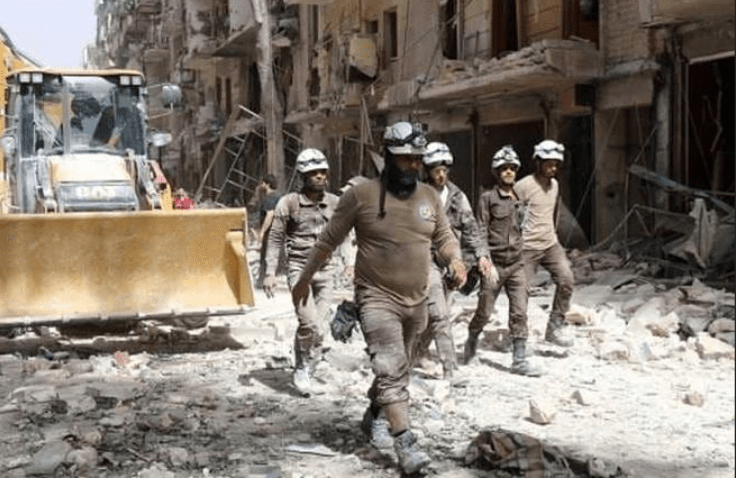 The White Helmets, or more formally, the Syrian Civil Defense, are composed of 3,000 volunteers who have saved at least 70,000 people since the Syrian civil war began in 2011. They have entered bombed out ruins of collapsing buildings to pull men, women and children from the rubble. Since the recent US funding cut, members of the White Helmets are concerned about how this will affect the team in the future. Although they have not been formally informed that their funding has come to a halt, volunteers on the ground in Syria say their funds have been suspended. The team have a contingency plan which will allow them to keep going for one or two months in an emergency situation, but they are worried about the future. An internal State Department document said that its Near East office was waiting for confirmation from the State Department would continue to either provide financial support to the White Helmets, or that it would start to close programs on a rolling basis. The document also said that the Department needed to be informed by 6th April that it could continue its programs to remove land mines, restoring basic services, providing food to moderate factions and their families, or that those programs would have to be closed down. The White Helmets are not the only aid group facing cuts. Last March, Trump’s administration froze $ 200 million from its program for recovery efforts in Syria. Many other programs may lose their funding too. US officials are trying to work out if there are other ways to cover the costs of these projects. They are also asking for support from other countries, like Germany, which recently pledged $1.1 billion at the Brussels donors conference to cover some of these costs. Up until now, however, Germany has not committed to stepping up their aid efforts. Observers share a growing concern about the young people of Syria, who could be vulnerable to extremism if denied the security and support they need in a country where thousands of schools have already been destroyed.